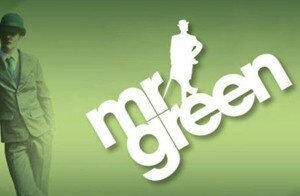 You don’t have to look far online to come across slot games with animals in them. The title of this NextGen slot gives away the token animal here, but you’ll want to come face to face with the wolf rather than avoiding it, for reasons that will shortly become clear. Are you ready to see if the Wolfpack really does pay? The Wolfpack Pays slot is a 5 x 3 slot game featuring no paylines – it has 243 ways to win instead. The dramatic backdrop of trees, rocks and rivers can be seen through and behind the reels, and while there are few symbols in play, it makes it easier to see the ones you really want to find. NextGen Gaming has created a fine slot here, with a smooth performance and a couple of interesting features too. 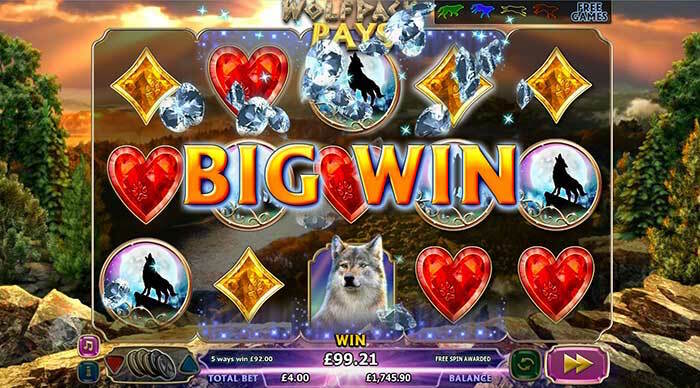 Some UK online slots don’t look that good in terms of design, but that doesn’t apply in this case. The graphics are impressive, and the backdrop changes from day to night when you unlock the free spins. It may not be the most complex slot game you’ll have ever seen, but the design does make for an easier viewing experience if you’re playing on a mobile or tablet. You have a limited number of symbols to look for as well, which makes life easier in many ways. You have six main symbols in play. The first four are the four suits of a pack of playing cards; the heart and diamond pay out slightly more than the other two if you get five of them. Aside from those, you have the eagle which pays 250x your bet for five, and of course the wolf. This appears as a silhouette howling at the moon, but you won’t be howling if you end up with five, as this pays 400x your bet. There isn’t a scatter in this game, but you have a wild which appears in the form of a wolf (of course). Get five and you’ll win 800x your bet. Where to begin? Well, Wolfpack Pays has an On a Roll feature that is triggered whenever you get a winning spin. This is basically a free spin, but you get more Wolf Wilds before it begins. This can be triggered four times in a row. When this happens, you unlock some free games. Keep an eye on the free games indicator at the top right to see how close you get. Another wolf will light up and start running with each winning spin you get. This is called the Wolfpack feature and you’ll enjoy a further five Wolf Wilds on the reels when this is triggered. When you are playing the free games, you’ll notice there are three paw tokens on the screen as well. When all of them disappear, your free games run will be over. As long as you keep winning, the free games will continue. Whenever you get a non-winning spin, one of the tokens vanishes. The Wolfpack Pays Slot offers a gamble feature in which players choose a red or black suit. If you bet against the correct colour, the win is doubled, if you bet against the correct suit, the win is quadrupled. Winnings may be gambled up to 5 times. The Wolfpack Pays slot game has a nice array of coin values to choose from. Look for the small pile of coins on the bottom left of the screen and you’ll spot a red down arrow and a blue up arrow. Use these to work out what level bet you want to try. The smallest bet is a penny, which gives you a total bet of 40p in all. The largest one is £2, giving rise to the highest total wager of £80. The payout rate looks to be settling at around 97.75%, which is pretty good. Perhaps the best aspect of the game is simply the fact that each win triggers a free spin, so you don’t have to wait to get a particular combination in order to enjoy some free games. Obviously the idea is to get four in a row to enter the main free spins round, but it’s good to know there are rewards even for one individual win at a time. 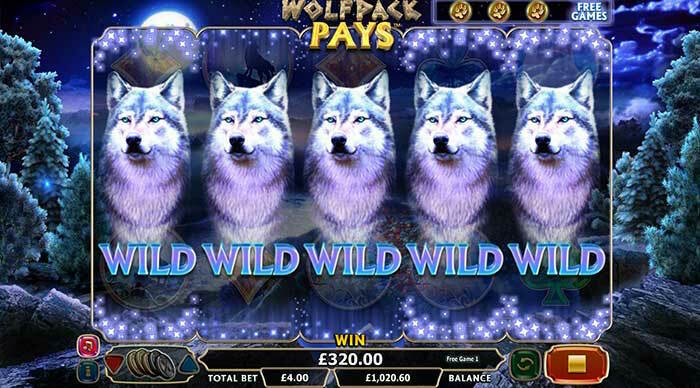 We predict Wolfpack Pays will turn into one of the more popular slot games for UK players, thanks to the features the creators have managed to shoehorn in. Initially we were disappointed to see so few symbols in play, and no scatter either. However, once we discovered the Wolf Wild and the other appealing features in the game, we realised just how much fun it would be to play. If you want to know how things work without placing a real wager, you can play the Wolfpack Pays slot in practice mode with fun money first. This is by far the best way to get used to how the wilds work and how those initial free spins can add up to a series of them if luck runs your way. All in all, Wolfpack Pays really does pay dividends when you give it a try.